Taipei is the capital of Taiwan. It is a global city which forms a part of the Taipei – Keelung metropolitan area. The first mention of the name is found towards the end of Emperor Kagxi’s rule. It referred to the area north of Zhuqian in northern Taiwan. In 1875, the Taipei prefecture was established by the Imperial Commissioner Shen Bao – Zhen. The city came under Japanese control in 1895 and a huge development project was undertaken. The city was given back to the Chinese in 1945. In 1949 it became the seat of the ROC government and the capital of the Republic of China. Today it covers an area of 271 sq km and is home to approximately 2.7 million. 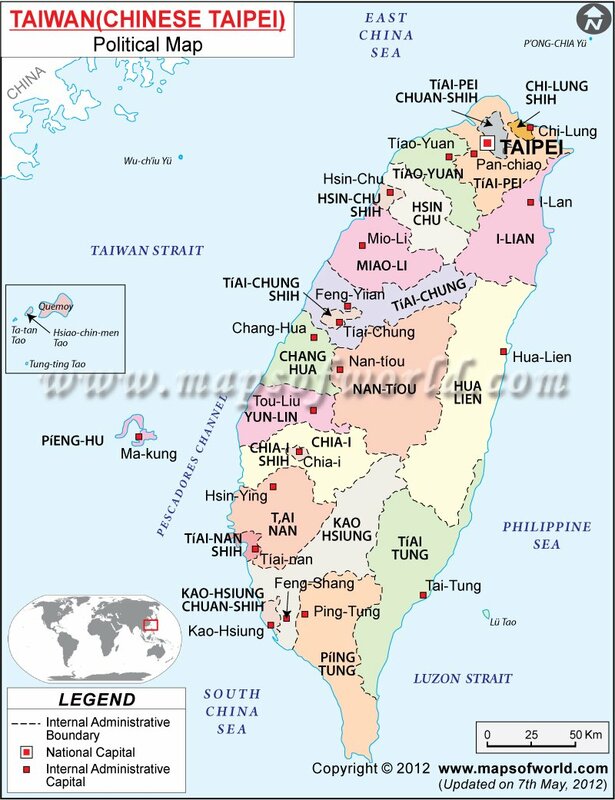 Taipei lies in northern Taiwan. The Xindian River flows in the South while Tamsui River lies on the west. 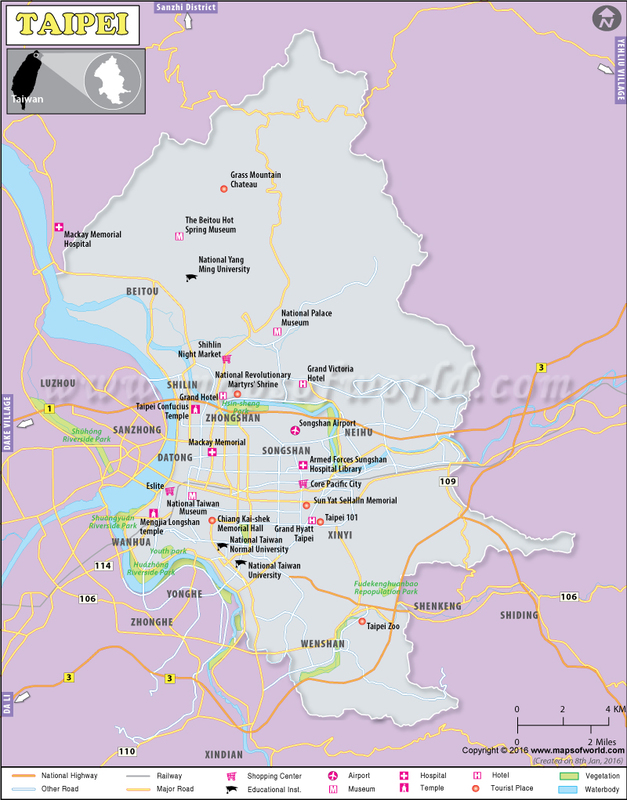 Besides, rivers like the Keelung, Shuangxi, Ziming (Sulphur) and Beitou also flow through this city. Volcanic mountains and hills occupy almost half of the city and the terrain is mostly low and flat. A part of the Datun volcanic range passes through the city while hill areas lie to the southeast edge of the city. Most of the city consists of flat river valleys though isolated hills like Qilian and Jiantan hills are found scattered here. The city has a humid subtropical climate influenced by monsoon winds. Summers are hot and humid with thunderstorms while winters are short, cool and very foggy. Typhoons from the Pacific affect the city between June and October. Taipei is connected by air to many major cities of the world. Flights operate to and fro from the Taiwan Taoyuan International Airport (previously known as Chiang Kai Shek airport). It is located 30 kms away from the city and you can travel by bus to the other corners of the city. In addition, the Songshan airport connects the city with several domestic destinations. Bus and High Speed Rail can easily be used to reach any domestic destination within the city. The best time to visit Taipei is in the fall in November and December. The temperature is pleasant and the rainfall is pretty low at this time. This is why it is the most comfortable time to visit. The society and culture of Taipei is a delightful blend of the old and the new. The traditional beliefs, religion and practices of Taiwan are very much present, but international trade and cultural exchange has helped Taipei to acquire a far more sophisticated veneer. The Foundation Day is celebrated on 1st January with parades, fireworks, Lion and dragon dances. In February, the Lantern festival is celebrated on the 15th of the first lunar month. Colorful lanterns of different shapes are carried by children and hung outside the house. The Eternal brightness festival is held in May. Families gather in cemeteries and sweep the graves of the loved ones and hand willow branches on them to ward off the restless spirits. Children fly kites; farmers plough new lands and young people are encouraged to begin courtships. The Dragon boat festival is held in June and boat races are the main event. Fragrant sachets are given to children. Mid autumn festival is celebrated in August to mark the end of harvest season. Barbecues are held; people gaze at the moon and moon cakes are eaten. Double Ninth festival is celebrated in October when elders are honored. Other festivals that celebrated with equal spirit and enthusiasm are Chinese New Year, Teachers Day, Youth Day and Constitution Day. The National Chiang Kai-shek memorial hall is surrounded by a magnificent garden and houses a museum displaying items from Chiang’s life. You can also see people practicing martial arts early in the morning. The Taipei 101 is the second tallest skyscraper in the world and is definitely worth a visit. The Sun Yat-sen memorial hall set amidst a park contains a vast library and often hosts concerts. The National Palace museum contains one of the best collections of Chinese antiquities and historical artifacts. The Shung Ye museum of Formosan aborigines is located opposite the above museum and contain articles related to aboriginal culture, belief, religion and lifestyle. Taipei Fine arts museum, National Taipei museum, Tittot museum are other places worth a visit. There is a vast choice of accommodation in Taipei ranging from the most luxurious to the budget ones. Five star hotels include Shangri-La, Agora Gardens, and Sheraton etc. Four star hotels are Riviera, Evergreen Laurel, Grand Hyatt, Royal Taipei, while three star hotels are The Moon, Li Yuan, Hotel B and Déjà vu. Golden China, One Star, Ecfa, Paradise, Go Sleep etc are budget hotels offering good, clean accommodation within reasonable budget.